Photo: The Israeli military’s new unmanned ground vehicle is self-driving and will be fitted with a machine gun. FoxNews.com reported that the Israeli military has equipped Ford F-350 pickup trucks with remote driving technology and plans to disperse them along the border of the besieged Gaza Strip. 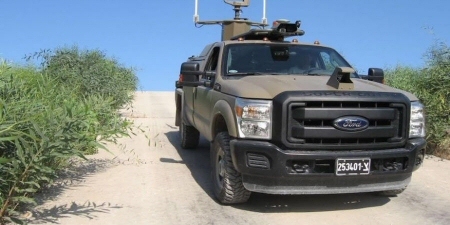 The trucks, called Border Protector Unmanned Ground Vehicles (UGVs), are each equipped with a 360-degree surveillance camera as well as four cameras that supplant a driver’s eyes on the road. G-NIUS – a joint venture between Israel Aerospace Industries (IAI) and Elbit Systems that enjoys funding by the Israeli defense ministry – developed the “Border Protector” specifically for Gaza. Testing began in July 2015 and ended in February 2016. The Israeli military plans to deploy the new UGVs semi-autonomously in the next few months. It will release them along Gaza’s border with complete autonomy soon thereafter. An official in the Israeli military explained to FoxNews.com, “we think at the beginning of next year we will get a machine gun on the vehicle that will be operated from a control room.” “The machine gun will not be autonomous,” the official clarified. The Israeli military has been using driverless vehicles to blockade the coastal enclave for years; its last model, the Guardium UGV has patrolled Gaza’s border since at least 2009. However, Israeli soldiers remotely controlled “the Gardium.” The new UGV, on the other hand, has the capacity to embark on a mission completely on its own after receiving directions from an Israeli soldier. The Israeli military has used the Guardium unmanned ground vehicle along Gaza’s besieged border since at least 2009. Photo by the Israeli military, September 2012. The State of Israel established a so-called buffer zone around Gaza after it withdrew from the area in 2005. According to the Palestinian Center for Human Rights, as a consequence of the buffer zone, 35% of Gaza’s agricultural land can only be accessed under high risk of death or injury. Though Gaza’s border continues to undergo increasing militarization, IAI and Elbit Systems have decided to dissolve G-NIUS, citing a lack of international buyers. In announcing the break up, both parties, however, maintained their commitment to developing autonomous military technology.